Colored Hemp Webbing now Available! Colored Hemp Webbing Now Available in stock and ready to ship. We have Natural, Black, Green and Blue available. The webbing is a canvas weave and is 1" wide. 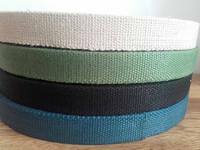 It's great for crafts and making items such as belts, guitar straps, dog collars, leashes and all other webbing type applications. It's available for purchase by the yard or in full rolls of 25 meter (27.3 yards). For more information and to check pricing click on the Shop Now button below.